Well, at least these times are not dull. Normally, we would be looking with wary eyes at record unemployment in Italy, deflation in Spain and plummeting French consumer spending. Or at big, smart, institutional money leaving the US housing market. None of these are small matters by themselves, but they are dwarfed by the groups of as yet mysterious militia, mercenaries, whatever they may be, I used the term guerrillas yesterday, that would do, who have taken hold of, first, yesterday, government buildings in the Crimea and then, today, airports. Yanukovych is due to do a press op today, and I doubt he will address why he ordered his elite troops to shoot and kill dozens of his own people last week, or why and how he was living in the kind of luxury that was found in his not so humble abodes. Which is too bad, because those are precisely the two issues that are giving Putin a headache about siding with him. Yanukovych and his PR crew seem to live in some old forgotten century (pick one), and Putin is not. And while there can’t be much doubt that the heavily armed mystery men are at least where they are with Putin’s consent (Moskou denies they’re Russian, calls them local defencemen and claims they’ve already left), for him they simply represent the ‘possession is 9/10 of the law’ principle, useful while he decides what to do with Yanukovych. Who perhaps more than anything has become a nuisance, but may still serve a purpose. Putin doesn’t seem likely to answer favorably to Ukraine’s extradition request for Yanukovych – for now he denies even knowing where he is – , though it would be a great publicity coup for him in the eyes of the west. Thing is, Putin is worried more about how he looks in his own part of the world, comprised of large amounts of tribes, peoples, regions, nations. Divide and rule is by far the best way to go for him. Maybe he’s busy finding or setting up a replacement for Yanukovych, and will then drop him. The one major point for Putin is the pipelines that flow through Ukraine (well, that and his Black Sea fleet in Sebastopol). He will never accept any interference with the rights to the pipelines, nor the revenue Russia derives from them. And of course he can’t be seen leaving Russians alone who live in Ukraine or other countries. Still, one look at the map of the Black Sea and Crimea region says it all, and Putin knows it: nobody will get sole control. A lot of Europe, including EU members, a lot of Russia and former Soviet republics, and Asia at the doorstep of the door that is secular Turkey. With the Bosporus as the only passage from the Black Sea to the Mediterranean and from there the world. So many parties with so many different interests, it’ll always be a delicate balance, but one for now that works for all. Shift or even poke the balance and who knows what you get? Yanukovych just did his press op, only 5 minutes or so, with an hour of Q&A. “I intend to continue the fight for Ukraine”, “I’m the legit president”, all the others are thugs, I did not flee, I was never impeached, Putin should come and help me, and why hasn’t he? He wants to return to his elected post. Looks like a man out of his time and zone trying to appear in control. Anyway, he’s brought his country to the brink of default, and blaming, among others, the US for that (which he does) serves little purpose other than domestic ones. There are a lot of people in Kiev who want to put him on trial for ordering the deaths of dozens of protesters, and who want to know where the billions came from that built his palaces. He won’t be able to just sweep those things aside. Switzerland and Austria have started up proceedings to invest his money trails in their countries, including accusations of money laundering, he’ll have to answer to those things too (denies having any possessions outside of Ukraine). Blaming the US and other western countries for the violence in Kiev is not going to help his case either. Putin for now is closer to for instance Merkel than to this guy. Civil war in Ukraine means disruption of oil and gas delivery. So no civil war unless he has no other way out. For whatever he gives on Ukraine to the west, he wants something back. Ukraine can maybe apply for EU membership, but they can’t get it for many years into the future. And if the negotiated conditions are good enough for him, Putin will then set up a Ukraine bailout together with the west. At the present time, Yanukovych, somewhat surprisingly, after accusing the west of instigating his ouster, seems to be chiding Putin for leaving him alone, not sending support, and refusing to meet with him. That makes him a lonely man indeed. And frightened. Austria will freeze the bank accounts of 18 Ukrainians following a request from Ukraine’s foreign ministry and pending possible European Union sanctions, the foreign ministry said on Friday. “Austria has decided to freeze possible bank accounts and assets of 18 Ukrainian citizens in Austria. This has been done on the basis of an official request by the Ukrainian foreign ministry,” the ministry said. It called the move “a temporary precautionary measure until EU restrictive measures enter into force”. After Ukraine suffered its bloodiest day since the Soviet era last week, the 28-nation EU agreed in principle to impose sanctions such as visa bans and asset freezes on unnamed senior Ukrainian officials. Austria said it would freeze accounts via a central bank decree under its foreign currency law. It did not identify the people affected or say how much wealth was seized. “The decree from the National Bank provides the appropriate legal basis to be able to determine which assets are actually in Austria and to prevent potential abuse,” Foreign Minister Sebastian Kurz told the Austria Press Agency. The EU cannot unilaterally tell banks to freeze assets without a legal decision agreed among all member states. Ukraine’s acting prosecutor general said on Wednesday the country will ask international organisations to help trace bank accounts and assets controlled by ousted President Viktor Yanukovich and his allies. Austria’s FMA markets watchdog has already warned banks to be vigilant about dealing with customers from Ukraine. Swiss police have raided the premises of a Geneva firm owned by ousted Ukrainian President Viktor Yanukovich and his son Oleksander in an investigation into “aggravated money laundering.” The Geneva cantonal ministry in charge of justice and police said the raid took place on Thursday morning and documents were taken away. The action was directed “against the Yanukovych clan,” it said in a statement on Friday. The ministry did not name the firm whose offices were searched or give further details. The raid was led by Geneva’s General Prosecutor, Yves Bertossa, who has headed investigations into many other money-laundering cases. There was no immediate indication if anyone had been arrested. “A criminal investigation for severe money laundering is currently being conducted in Geneva against Viktor Yanukovich and his son Oleksander,” the statement said. The Swiss governnment said on Thursday it would order banks to freeze any funds in Swiss banks found to be linked any Yanukovich funds. The followed similar action by Austria. Ukraine will ask Russia to extradite ousted President Viktor Yanukovich if it is confirmed that he is in Russia, the general prosecutor’s office said on Friday. “Ukraine’s Prosecutor-General intends to raise the issue of the extradition of the internationally wanted citizen of Ukraine Viktor Yanukovich in case it is officially confirmed that he is in the Russian Federation,” it said in a statement. Ukraine’s new Prime Minister, opposition leader Arseny Yatsenyuk, has promised the government would do its best to avoid a default, a difficult task as the country’s treasury is empty and the economy is in disarray. Yatsenyuk says he expects an EU/IMF economic stabilization package soon, but didn’t give any specifics on timing. Strengthening ties with the European Union and the International Monetary Fund will remain a priority as Ukraine rebuilds, Yatsenyuk said on Thursday in Kiev, Itar-Itass reported. Yatsenyuk said negotiations with Russia would continue, and he considers the neighboring country “a partner”. The IMF failed to come through with a loan of $10-15 billion last August, and it remains to be seen what offer they will come up with for the new government. But in December Ukraine signed a $15 billion loan deal with Russia. The first $3 billion was paid to Ukraine in December, but the second installment of $2 billion, is postponed until Moscow deems Ukraine has formed a legitimate government. Yatsenyuk believes the economic trouble ahead will likely make him the most unpopular PM in Ukraine’s history. Ukraine has a massive debt, both domestically and abroad. Propping up its overvalued currency with interventions has drained much of the country’s foreign exchange reserves, which are now close to $15 billion. As a%age of GDP, Ukraine’s public debt stands at 40.5%. In summer 2014, a debt payment of $60 billion, or about one third of the economy is due, according to Central Bank data. The EU was disillusioned with the Yanukovich government when he didn’t sign the European Trade Association Agreement in November. On the brink of collapse, a move towards the EU could spell the end of Ukraine’s economy, which the S&P ratings agency already has said is likely to default. Fitch ratings agency says the risk of a sovereign debt default is high and has also downgraded credit to junk status. Ukraine’s new pro-Western leadership faced a double challenge Thursday that raised fears of a separatist conflict that could draw in Russia. Armed men took over a regional legislature and a pro-Russian leader was installed, while the ousted president broke a days-long silence to declare himself still in charge. Russian forces began exercises on Thursday, as armed pro-Russia activists took over the Crimean parliament building and fugitive former Ukraine president Viktor Yanukovych released a defiant statement. Via The Foreign Burea, WSJ’s global news update. As the events unfolded in the autonomous region of Crimea, which has emerged as the epicenter of resistance to the new leadership in Kiev, former President Viktor Yanukovych issued a public statement for the first time since he was deposed on Saturday. Mr. Yanukovych said he remains the lawful president of Ukraine and asked Russia for protection, a request Moscow, speaking through unnamed officials to state news agencies, promptly granted. The rapid-fire developments raised the prospect that Crimea, which until 1954 was part of Russia and still hosts Moscow’s Black Sea Fleet, might seek greater autonomy or even secede from Ukraine. The Crimean legislature called a referendum on the region’s status for May 25. Late Thursday, Russian President Vladimir Putin ordered his government to arrange “humanitarian aid” for Crimea, where ethnic Russians make up the bulk of the population. A separatist Crimea could wind up like other Moscow-backed breakaway regions across the former Soviet Union, such as Transnistria, Abkhazia and South Ossetia. All are contested territories that Russia’s neighbors accuse the Kremlin of using as levers to pressure them. U.S. Secretary of State John Kerry said any Russian involvement in developments in Crimea would conflict with its public statements about respecting Ukraine’s borders. “I think [Russians] understand that to keep faith with their affirmation about protecting territorial integrity, you can’t be encouraging the separatist movement or some other effort,” Mr. Kerry said in Washington. He said he warned Russian Foreign Minister Sergei Lavrov in a telephone call Thursday that Washington would be watching. Mr. Kerry said Mr. Lavrov reaffirmed an earlier commitment by Mr. Putin to respect the territorial integrity of Ukraine and assured the U.S. that the Russian military exercises announced this week aren’t related to recent events in the former Soviet republic. Mr. Kerry also expressed concern about possible missteps by the new government in Kiev, which was swept to power after months of street protests against Mr. Yanukovych turned violent last week, killing dozens. In the aftermath of the revolution in Ukraine – in which pro-Western and nationalist Ukrainians have taken power after the fall of President Viktor Yanukovych – there are fears that the southern region of Crimea could become a battleground between forces loyal to Ukraine and Russia. Crimea is a centre of pro-Russian sentiment, which can spill into separatism. The region – a peninsula on Ukraine's Black Sea coast – has 2.3 million inhabitants, most of whom identify themselves as ethnic Russians and speak Russian. The region voted heavily for Viktor Yanukovych in the 2010 presidential election, and many people there believe he is the victim of a coup – leading to attempts by separatists in Crimea's parliament to push for a vote on whether it should leave Ukraine. Russia has been the dominant power in Crimea for most of the past 200 years, since it annexed the region in 1783. However, it was transferred by Moscow to Ukraine – then part of the Soviet Union – in 1954. Some ethnic Russians see that as a historical wrong. However, another significant minority, the Muslim Crimean Tatars, point out that they were once the majority in Ukraine, and were deported in large numbers by Soviet leader Joseph Stalin in 1944 for alleged collaboration with Nazi invaders in World War Two. Tatars have been returning since the collapse of the Soviet Union in 1991 – causing persistent tensions with Russians over land rights. It remains legally part of Ukraine – a status that Russia backed when pledging to uphold the territorial integrity of Ukraine in a memorandum signed in 1994, also signed by the US, UK and France. It is an autonomous republic within Ukraine, electing its own parliament. However, the post of Crimean president was abolished in 1995, shortly after a pro-Russian Crimean separatist won the post with a big majority. It now has a presidential representative, and a prime minister, but both are appointed by Kiev. 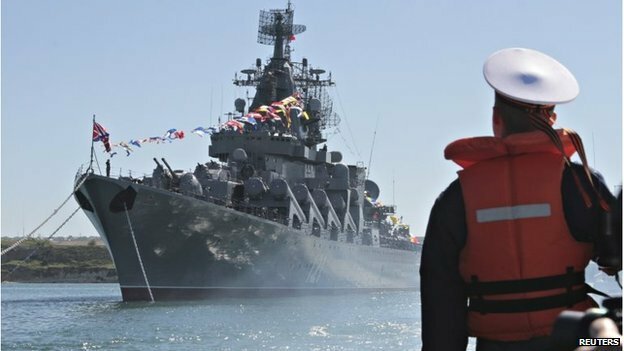 Russia keeps a major naval base in the Crimean city of Sevastopol, where its Black Sea Fleet is based. Some Ukrainians are therefore nervous about Russia's military might being brought to bear. The lease stipulates that Russian personnel should not take military equipment or vehicles outside the base area without Ukrainian permission. Olexander Turchynov, Ukraine's acting president, warned that any move by Russian troops off of their base in Crimea "will be considered a military aggression". There are reports of Russian envoys distributing Russian passports in the peninsula. Russia's defence laws allow military action overseas to "protect Russian citizens". This has sparked fears of Russia using this as a pretext for invasion. Russia used a similar justification for sending troops into Georgia's breakaway region of South Ossetia in 2008, routing Georgian forces which had tried to take back control. As with Georgia, Moscow resents what it sees as EU and Nato overtures to Ukraine. And after all, Nato decided not to come to Georgia's defence. But Crimea is bigger than South Ossetia, Ukraine bigger than Georgia, and the Crimean population more divided than in pro-Russian South Ossetia – making Russian intervention in Ukraine a bigger gamble. Wasn’t there once a war in Crimea? Crimea has been fought over – and changed hands – many times in its history. 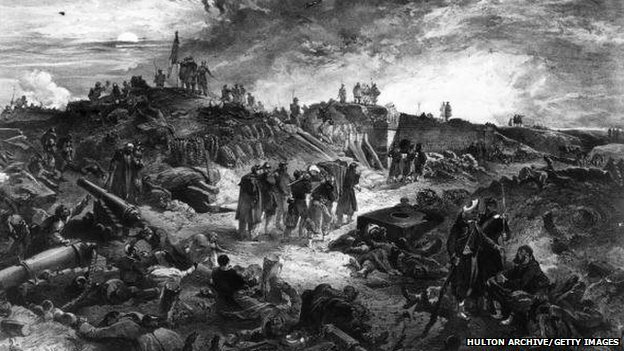 The occasion many will have heard of is the Crimean War of 1853-1856, known in Britain for the Siege of Sevastopol, the Charge of the Light Brigade, and the medical advances made by Florence Nightingale and Mary Seacole. The carry trade fight gets serious. China’s yuan tumbled by the most on record on speculation the central bank will widen the currency’s trading band, allowing greater volatility at a time when growth is slowing in the world’s second-largest economy. The yuan plunged as much as 0.85% to a 10-month low of 6.1808 per dollar in Shanghai, the biggest intra-day drop in China Foreign Exchange Trade System prices going back to 2007. That took it within 0.04% of the weak end of its trading band, which limits moves in the spot rate to 1% on either side of the central bank’s daily reference rate. The fixing was set at 6.1214, from a 12-week low of 6.1224 yesterday. The People’s Bank of China is expected to double the yuan’s trading band by the end of June, according to the majority of 29 analysts surveyed by Bloomberg, as policy makers loosen exchange-rate controls and promote greater usage of the currency in global trade and finance. Lawmakers will meet next week to decide on major economic policies and an official report tomorrow is forecast to show manufacturing expanded this month at the slowest pace since June. Goldman Sachs Group Inc. said a combination of macroeconomic and currency reform objectives are behind the yuan’s sudden drop, according to a report published yesterday by analysts including Kamakshya Trivedi. There are growing concerns over the growth impact of a credit buildup in the last few years, the report said. Policy makers also want to discourage leveraged bets on yuan appreciation, especially by local companies, it said. “There are sound reasons why local policy makers would welcome the kind of depreciation and volatility we have just seen,” the analysts wrote. “To the extent that policy makers care to discourage such carry trade activities — particularly for local entities — introducing volatility in the currency is the obvious way of shaking investors out of such carry exposures,” they said. I never find this overly interesting. If it ever happens, it’ll be a long way into the future. The Chinese yuan can overtake the dollar as the leading international reserve currency, a new poll of institutional investors indicates. The authors of the survey, conducted by the Economist Intelligence Unit and commissioned by State Street financial services, polled 200 senior executives at institutional investors with knowledge of their exposure to yuan assets. Half of the respondents were from the firms headquartered in mainland China (including Hong Kong and Taiwan) and the other half were based elsewhere. The report accompanying the survey points out that by the end of 2013, the yuan has risen to become the second-most-used trade financing currency and ninth-most-used currency for payments globally. A majority – 53% of respondents said that they believe the yuan will one day surpass the dollar as the top currency in international holdings of foreign-exchange reserves. In China 62% expressed this opinion, compared to 43% of respondents outside the country. Last May International Monetary Fund analysis showed that the dollar had slumped to a 15-year low, heightening concerns that it may lose that status as global reserve. Chinese officials are diligently working on sustaining their national currency, promoting it beyond the frontier. In October 2013, the government of China agreed a pilot program to create a UK based yuan hub that allows London investors to buy up to $13.1 billion (80 billion yuan) of stocks, bonds and money market instruments directly, avoiding Hong Kong transactions. The move gave the yuan a firmer footprint in Europe and helped to overcome the euro in December, becoming the second most widely used currency in global trade. But the consensus is that one day it will be a yuan world, according to the survey. “As China’s economic influence grows, the global importance of the renminbi (yuan) will become magnified. Indeed, while for decades it has been a ‘greenback world’, dominated by the US dollar as the world’s primary reserve currency, many think a ‘redback world’, in which the renminbi enjoys premier status, is increasingly a possibility,” the survey’s authors concluded. China’s manufacturing activity is likely declined to an 8 month low in February, after showing only a modest PMI expansion of 50.1, according to Reuters’ data. The median forecast of 12 economists suggests the downturn is continuing, and in February the Chinese PMI may slide to 50.1, compared to January’s 50.5. PMI activity above 50 means an expanding economy, while an index below leads to contraction. Last time the index showed contraction in China was in September 2012, when it fell to 49.8. If the economists’ estimates for February are right it will be the third straight month of decline since November’s 51.4. The HSBC and Markit Economics survey released last week showed some negative figures for the Chinese economy. The manufacturing sector hit a seven-month low at 48.3, from 49.5 in January. Moreover the index of new orders fell below 50, while employment reached its lowest point since the global financial crisis. “Usually we observe if the HSBC PMI has seen such a big decline, then the official one will also see a similar downward trend, but not as bad,” Reuters quotes Wei Yao, China economist at Societe Generale in Hong Kong. The HSBC and Markit survey focuses mostly on smaller firms and those in the private sector, while the official PMI index is heavily oriented to state-owned and big enterprises that have a weight. Thus the official picture of national manufacturing activity may look more positive than it really is. “When the economy slows down, usually the private sector feels the squeeze first,” Yao said..
It’ll take a few months before we see the effects of this, but it might yet hurt. In real estate, national averages paper over the gritty details on the ground and are a crummy, often contradictory indicator as to what is happening in specific metro areas. When a new trend starts or when a reversal takes place in some locations, it’s watered down by data from other unaffected locations to form the overall averages. But even with this caveat, a national average suddenly sounded an alarm for the housing market: the smart money has started to bail out. The smart money entered the housing market gingerly in 2011 then piled in helter-skelter over the next two years, gobbling up vacant single-family homes out of foreclosure. The forays were funded by Wall Street, awash in the Fed’s crazy-money. The smart-money operators trained their guns on specific markets, such as Phoenix and Las Vegas, and bought homes by the thousands that they tried to rent out. Then they spread their campaigns to other cities. The tally has reached 200,000 single-family vacant homes for which they’re now trying to find tenants. In the process, mega-landlords have emerged. On top of the heap: Invitation Homes, a unit of private-equity giant Blackstone Group, and American Homes 4 Rent, a highly leveraged REIT that went public last August. As in the heyday before the financial crisis, their smartest minds are now feverishly at work trying to figure out how to shuffle risks and future losses off to yield-desperate investors who’ve been driven to near-insanity by the Fed’s relentless repression of interest rates. So Blackstone and American Homes 4 Rent have started selling synthetic structured securities that are backed, not by mortgages, like the toxic waste before the financial crisis, but by something even classier, rental payments – based on the rickety hope that these single-family homes will stay rented out. Wall Street is already jubilating: the market for this type of synthetic monster is estimated to be $1.5 trillion. But now the party appears to be running out of booze. This frantic institutional buying has driven up home prices – in some areas above the levels of the prior bubble. Trying to make money by buying these homes at inflated prices and renting them out into a tough job market where strung-out consumers with declining real wages have trouble making ends meet has become a precarious business model. In some of the formerly hottest metro areas, purchases by large institutional investors – those having bought at least 10 properties over the past 12 months – plunged in January from a year ago, according to RealtyTrac’s Residential & Foreclosure Sales Report: in Jacksonville, Florida, by 21%; in Tampa, by 48%; in Tucson, 59%; Memphis, 64%; in Cape Coral-Fort Myers, Florida, by 70%! Institutional purchases hit the skids in over three-quarters of the 101 metro areas that RealtyTrac analyzed, their share dropping to 5.2% overall, from 7.9% in December, and from 8.2% in January 2013. It was the lowest monthly share since March 2012, at the infancy of this whole bonanza. Bankrupted by trash producing tourists. A fitting end for a great empire? The Eternal City, now teetering on the brink of a Detroit-style bankruptcy, has served Italy’s new prime minister his first major political headache. On the first day of his premiership, Matteo Renzi had to withdraw a decree, promulgated by his predecessor, that would have helped the city of Rome fill an €816 million ($1.17 billion) budget gap, after filibustering by opposition lawmakers in the Parliament on Wednesday signaled the bill had little likelihood of passing. Devising a new decree that provides aid to Rome will now cost Mr. Renzi time and political capital he intended to deploy in promoting sweeping electoral and labor overhauls during his first weeks in office. For Rome’s city fathers, though, the setback has more dire consequences. They must now face unpalatable choices—such as cutting public services, raising taxes or delaying payments to suppliers—to gain time as they search for ways to close a yawning budget gap. If it fails, the city could be placed under an administrator tasked with selling off city assets, such as its utilities. “It’s time to stop the accounting tricks and declare Rome’s default,” said Guido Guidesi, a parliamentarian from the Northern League, which opposed the measure. Rome’s mayor, Ignazio Marino, a U.S.-trained transplant surgeon, rode to electoral victory last year on promises to vanquish nepotism, improve basic services and bolster tourism in the city center with initiatives such as keeping the Imperial Fora illuminated and open all night. Instead, he has been battling to hold together the budget. On Wednesday, he signaled he had no intention of presiding over deep cuts, while the head of the city council warned of the broader impact of Rome’s financial troubles. “A default of Italy’s capital city would trigger a chain reaction that could sweep across the national economy,” said Mirko Coratti, head of Rome’s city council said on Wednesday. The heart of the mayor’s plan has been an appeal for a €485 million transfer from the central government to compensate Rome for the extra costs it incurs in its role as a major tourist destination, the nation’s capital and the seat of the Vatican. “Rome is unique compared with other cities” and deserves state support because of huge numbers of visitors who use services but don’t contribute much to the economy, Mr. Marino said in a recent interview. But even before the government of Enrico Letta fell this month, the proposed transfer had prompted complaints that the aid was unfair, given the dire straits of other cities. Rome has long struggled to balance its books. Because of its dearth of industry, the city depends heavily on trash-collection levies and the sale of bus and subway tickets. It struggles much more than other European cities to collect either one. About one in four passengers on Rome’s public transit system doesn’t buy tickets, costing around €100 million in lost revenue annually, compared with just 2% of passengers on London’s public transit network. Meanwhile, employee absenteeism at Rome’s public-transit and trash-collection agencies runs as high as 19%, far above the national average. Just six years ago, some €12 billion in city debts was transferred to a special fund subsidized and guaranteed by the national government in a move aimed at giving Rome a fresh start. But Italy’s economy has shrunk by almost 10% since then, eroding the tax base just as national austerity programs pushed extra costs onto local governments. Even before the withdrawal of the “Save Rome” decree, Mr. Marino was facing unpalatable choices. He has already raised cremation and cemetery fees and plans to centralize city procurement, which he says will save €300 million a year. Now, without the transfer from the central government, he may be forced to impose income and property tax surcharge—already among the highest in the country—and to cut salaries to the city’s 20,000 employees or trim city services such as child-care centers or job-training programs—also unpopular moves. Natural optimism + bad news = denial and blame. Don’t kid yourself. Anxiety’s still sky high. Hidden in denial. Fears of a 2014 crash haunt us like bloody horror films, “Dawn of the Dead,” “Friday the 13th,” “Psycho.” The two 1929 and 2014 charts really are scary. And that anxiety is now trapped deep in America’s collective unconscious. Reflected in the wild screaming roller-coaster ride of the volatility index, a loud voice of investor fears. No idea, but we feel it. Same reaction when we reported relentless bear rumblings last year from Bill Gross, Jeffrey Gundlach and Charlie Ellis, Gary Shilling, Nouriel Roubini, Peter Schiff and many more. Bad news. Who’s to blame? Optimists strike out: Shoot the messenger. And yet what’s really fascinating is that so many continue reading columns year after year. We don’t make up bad news. But they feed on it, need to project their feelings. The best stick to their trading systems. Silently take personal responsibility. A classic human trait: Basic psychology: We take charge, or project that which we don’t like in us onto others. Blame them, a common Freudian defensive mechanism that so many do unconsciously.. Yes, optimism is in your head, not “out there.” We want the good news, promises of endless returns. Like the pre-1929 Great Gatsby era: Just before the 1929 Crash, the 10-year Great Depression, Yale economist Irving Fisher assured the anxious masses: “Stock prices have reached what looks like a permanently high plateau.” Today, behavioral economists tell us the vast majority of America’s 95 million investors don’t want bad news, prefer Wall Street’s perpetual optimism machine. No wonder we lose trillions in crashes. 200 African immigrants scaled a 60 foot fence yesterday. Ten years ago Spain spent more than €30 million building up the barriers around Melilla and Ceuta, its two enclaves surrounded by Morocco on the northern coast of Africa, which offer the only land borders between the promise of Europe and the despair of Africa. And for a while the investment seemed to work. But in the past year, large groups of sub-Saharan immigrants have been charging the rows of seven-yard-high chain-link fences here with increasing frequency, or trying to swim around them, believing with good reason that if they can just get past they will ultimately end up in Europe. They often end up injured, not just from falls and the newly laid concertina wire, but at the hands of the Moroccan and Spanish authorities trying to stop them. This month the Spanish military police in Ceuta, facing about 250 immigrants climbing the fences or swimming near the shoreline, fired rubber bullets into the water, drawing outrage from European Union officials and human rights activists. It is not yet clear whether the officers of the Guardia Civil hit the immigrants or whether they drowned in the melee. But so far, 15 bodies have been recovered from the water. At first Spanish officials denied there had been any shooting. But since then, they have admitted that bullets were fired, raising questions about just what actions are appropriate in dealing with immigrants who do not represent an immediate threat and prompting Cecilia Malmstrom, the European Union’s commissioner for home affairs, to demand clarifications from the Spanish authorities. It is a question that has hounded Europe for years, as immigrants fleeing wars or simply wanting a better future have tried to break through its borders, sometimes dying in tiny boats headed for the Canary Islands, part of Spain, or the Italian island of Lampedusa, sometimes trying to walk from Turkey to Greece or Bulgaria. Or, as they are doing now, charging the fences of these enclaves, seeking out even the smallest doorways to Europe. Spanish officials, who have not sounded particularly repentant about actions at the border, have now appealed to the European Union for help, including financial, saying the burden of protecting Spain’s borders should not be theirs alone. They are also considering changes in the immigration laws to make it easier to immediately eject immigrants who do make it over the fences. Most have had brutal journeys and now will probably spend a year or more in the immigration center as their applications for asylum are processed. Few will get such status. But most will end up transferred to the mainland before being handed an order to leave Spain. Most cannot be deported because Spain does not have treaties with many of the countries they come from. So in the twist that has confounded Europe’s efforts to secure its borders for decades now, many of those who make it to Melilla and Ceuta will be largely free to remain in Spain or other European nations that offer them the prospect of better lives. Nobody knows exactly why, after nearly a decade of relative quiet, the pressure on Ceuta and Melilla has started again, but Spain’s economic crisis may have something to do with it. Spanish officials here acknowledge that Spain has lately had to cut back on aid to Morocco, which has in recent years kept sub-Saharan Africans from getting too close to the enclaves. Imagine, then, that sometime this spring, when you visit some outdoor public place, you encounter a half dozen young people dressed identically in bright green T-shirts, surplus black BDU trousers, and army-style boots. They’re clean-cut, bright, and enthusiastic, and they want to interest you in a new political movement called the American Peoples Party. You’re not interested, and walk on by. Does it come with fries? Next month, the World Wide Web turns 25 years old. (Yes, you are getting older). First proposed by Tim Berners-Lee in 1989, the Web drastically increased the number of people on the Internet. Now, the Pew Research Center is taking a look back with its report “The Web at 25.” It’s filled with interesting tidbits about how Americans viewed technology in the past — in 1995, 42% of them had never heard of the Internet — and how they view it now. Here is a look at the country’s relationship with the Internet today. 90%: Americans who think that the Internet has been a good thing for them personally. $75,000: Income level were Internet usage almost becomes ubiquitous. A full 99% of Americans who report this much household income are on the Web. 28%: Landline telephone owners who would find it “very hard” to give up their phones. That is a big drop from 2006, when 48% of landline owners struggled with the idea of giving up their phones. 11%: The gap between those who would find it “very hard” to give up the Internet (46%) and television (35%). 58%: Americans who own a smartphone. 3-to-1: Ratio of Internet users who think that social media strengthens their relationships versus those who think it weakens them. 76%: Internet users who say the people they witness or encounter online are “mostly kind” to each other. A family of wild beavers has been seen in the England countryside in what is believed to be the first sighting of its kind in up to 500 years. Three European beavers (Castor fiber), believed to be adults, have been filmed together on the River Otter in east Devon and can be seen gnawing at the base of trees, grooming themselves and playing together. Experts said the sighting was “highly significant” as it strongly suggested a small breeding population of beavers now existed outside captivity. European beavers were once widespread in the UK but were hunted to extinction by the 16th century in England and Wales for their fur, medicinal value and meat. There have been successful reintroduction schemes in other parts of the UK. In 2009, three beaver families were released into forest lochs near the Sound of Jura in Argyll, while plans to release the species into the wild in Wales have also moved a step closer. The sighting in Devon would be the first time in centuries that European beavers have bred in the wild in England. The footage was captured by local retired environmental scientist Tom Buckley, who noticed some trees had been felled in the area in late last year. Together with landowner David Lawrence, he installed three motion sensor cameras along a 400-500m stretch of the river. A lone beaver was spotted on the farm in January and last July a woman claimed she saw a beaver on the river. “We’d seen bits of trees chewed and cut down and I was starting to think that it was a sign of beavers even though I couldn’t believe it,” Buckley said. Why are we still having this conversation? Isn’t it obvious enough? Is it really necessary to legitimize a bunch of coneheads by addressing their verbal blubber? We don’t deal with creationism this way either, do we? US and British scientific academies say there is a clear consensus that climate change is real and will have serious disruptive effects on the planet. The US National Academy of Sciences and Britain’s Royal Society said they were making the joint declaration in hopes of moving the public debate forward – to the question of how the world responds, instead of whether climate change is happening. The academies cautioned that science inherently cannot settle every detail and that debate remained on some specifics, including how much climate change is linked to extreme weather events. But it said scientists were “very confident” that the world will warm further in the next century and that a rise by just a few degrees Celsius would have “serious impacts” that are expected to include threats to coasts and food production. Amid a bitter winter in several parts of the world, the academies stressed that global warming is a “long-term trend” and that day-to-day weather can still be unusually cold or warm. Climate change is already widely accepted by scientists. The Intergovernmental Panel on Climate Change, a United Nations-backed group of scientists, said in a report in September that it was more certain than ever that humans were causing rising temperatures and that heat waves, droughts and other threats would intensify. But there has also been a backlash, including in the United States where industry-friendly conservative lawmakers have questioned the science as they oppose laws to curb carbon emissions blamed for climate change. Out of left field, but interesting. New research suggests a strong link between the powerful smell of pine trees and climate change. Scientists say they’ve found a mechanism by which these scented vapours turn into aerosols above boreal forests. These particles promote cooling by reflecting sunlight back into space and helping clouds to form. The research, published in the journal Nature, fills in a major gap in our understanding, researchers say. One of the biggest holes in scientific knowledge about climate change relates to the scale of the impact of atmospheric aerosols on temperatures. These particles form clouds that block sunlight as well as reflecting rays back into space. They can be formed in a number of ways, including volcanic activity and by humans, through the burning of coal and oil. According to the Intergovernmental Panel on Climate Change (IPCC), they “continue to contribute the largest uncertainty to estimates and interpretations of the Earth’s changing energy budget.” One of the most significant but least understood sources of aerosols are the sweet-smelling vapours found in pine forests in North America, northern Europe and Russia. These aerosols have confounded climate models as scientists haven’t been able to accurately predict how many of the particles form. Now an international team of researchers say they have solved the chemical mystery by which the rich odours become reflective, cooling particles. They’ve long understood that the smell of pine, made up of volatile organic compounds, reacts with oxygen in the forest canopy to form these aerosols. The scientists now found that, in fact, there is an extra step in the process, what they term a “missing link”. They’ve discovered ultra-low volatility organic vapours in the air that irreversibly condense onto any surface or particle that they meet. This topic contains 3 replies, has 3 voices, and was last updated by ted 5 years, 1 month ago. The yuan as a reserve currency? The currency of the worlds largest gold producer? I see that as quite possible in the not distant future. And considering the political mismanagement of a net debt based dollar, even sooner, when all this unbacked world paper is marked to reality. If not “the” reserve currency, at least “a” reserve one. Especially considering the rest of the world is tiring of living under monetary control of an unelected handful of US bankers. I remember in around the early 80’s a guy, who was just getting into computer component imports in Silicon Valley, telling me that Free Text Search was coming but not in our lifetimes. Must have been before Moore’s Law?